SpectorDance Company is thrilled be showcasing at APAP (Association of Performing Arts Presenters) with a performance of Ocean Trilogy! Ocean Trilogy goes to New York City in January! "Ocean Trilogy is a fresh, moving interpretation of the existential threat that our greenhouse gas emissions present – to our ocean and to ourselves. The dancers were both powerful and fragile, like our planet. It was breathtaking to experience these expert insights in juxtaposition with live movement. I left motivated to push forward for collective action." Kera Abraham Panni, Monterey Bay AquariumSpectorDance has a seven-year history of developing ocean-related arts education programs in partnership with world-class scientists at MBARI. Joining art and science is an innovative pathway for both disciplines to engage audiences. Ocean Trilogy, premiered in September of 2017. Based on interviews with MBARI scientists George Matsumoto, Steve Haddock, Francisco Chavez, Judith Connor and communication experts from the Monterey Bay Aquarium, Ocean Trilogy highlights exciting and hopeful possibilities for solving and adapting to the challenges facing ocean health. Visual projections and interview footage are integrated with music by composers Bryce Dresnner and Philip Glass, contemporary dance performance, and rap/spoken word narration. Themes explored in the performance include the power of the imagination, bioluminescence, engineering and the importance of cross-disciplinary partnerships. Ocean Trilogy was performed at the Monterey Bay Aquarium, the Monterey Museum of Art, and on tour at the Santa Barbara Maritime Museum. In 2018, Ocean Trilogy will be presented at the Association of Performing Arts Professionals Conference in New York City on January 14 at the Alvin Ailey Dance Theater. In 2019, Ocean Trilogy will be presented at Stanford University. Ocean Trilogy is co-presented with the critically acclaimed hip-hop theater production Rap Guide to Climate Chaos (“Smart, funny, and informative” – HuffPost), written and performed by award-winning rapper and science communicator, Baba Brinkman. His brilliant style of “peer reviewed rap” makes complex science accessible to all audiences. 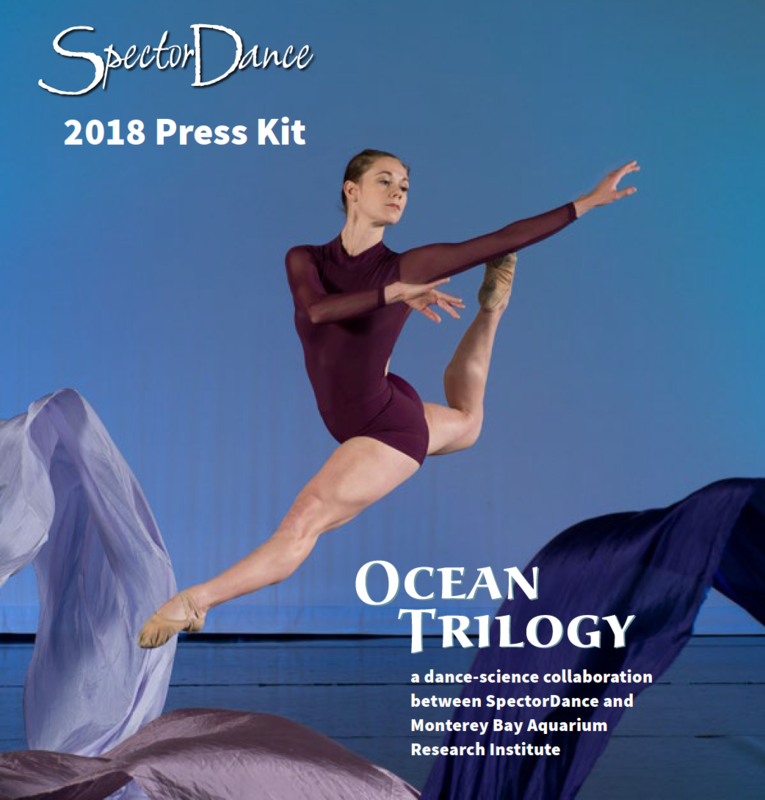 By weaving together dance, scientific information, underwater film footage, and live rap performance, SpectorDance and Brinkman offer a performance experience that highlights climate and ocean science in a fresh way that reaches people's hearts and minds in equal measure. Along with performances of Ocean Trilogy, we also can offer science presentations followed by creative workshops where students will have an opportunity to share their own expressive response to the scientific information. Artistic works created in these workshops will be posted on the the SpectorDance website or in some cases exhibited along with future performances. We can also provide interactive discussions with scientists developed to accompany the performances, and will be tailored to each specific venue and audience. Workshop activities will include dance, song, rap, and visual art, paralleling the elements combined in the live performance. Ocean Trilogy has been endorsed by world-renown composer Philip Glass, who is working in Monterey to establish the new Center for Science, Art and the Environment. The mission of the Philip Glass Center is "to gather the world’s leaders in the fields of art, science and the environment for a broad array of interdisciplinary activities including performances, seminars, and education programs that inspire and motivate the public to become engaged with matters vital to the future of the natural environment and the quality of human existence." Ocean Trilogy is a collaboration between SpectorDance and the Monterey Bay Aquarium Research Institute highlighting the health of our ocean at a critical moment in human history. Inspired by interviews with renown ocean experts, this 45-minute multidisciplinary piece explores the human impacts challenging our ocean, innovations and hopeful possibilities from cutting-edge ocean science research, and the importance of embracing science as the foundation for making informed policy decisions. Ocean Trilogy weaves together rap and classical music, urban and contemporary dance, visual images, and spoken word into a unique production. Performances may also include a presentation by an MBARI researcher. Ocean Trilogy aims to communicate science in a way that reaches people's hearts. Ocean Trilogy aims to promote conversation and to inspire the next generation of ocean stewards. "The show was wonderful, Fran! I’ve never seen anything like it. What a fresh, moving interpretation of the existential threat that our GHG emissions present – to our ocean and to ourselves. The dancers were both powerful and fragile, as we all are. Baba voiced some hard truths that I struggle with as a science communicator. The video and audio clips were clearly the result of patient, painstaking, thoughtful edits. It was breathtaking to experience these expert insights in juxtaposition with live movement. Tears came to my eyes several times, yet, I left motivated to push forward for collective action." "Ocean Trilogy is a masterpiece in the making." "Ocean Trilogy helps people connect profoundly with ocean issues more than we might just through our mind's ability to process information and connect dots. The impact goes deeper when our body or emotions become engaged, too. Jane Parker Ocean Trilogy helps people connect profoundly with ocean issues more than we might just through our mind's ability to process information and connect dots. The impact goes deeper when our body or emotions become engaged, too. "